Info Congressman Jim Saxton (R) has represented the people of the Third Congressional District of New Jersey since 1985. A former schoolteacher and small business owner, Saxton has used his private sector experience to forge an aggressive, constituent-oriented agenda in the U.S. House of Representatives. Saxton's committee assignments reflect the needs and priorities of the people who live, raise families, and do business in Central and Southern New Jersey. 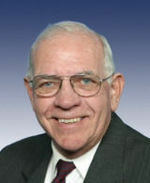 In January 2001, Speaker of the House Dennis Hastert designated Saxton as Chairman of the Joint Economic Committee. He is also a senior Member of the House Armed Services Committee (HASC). In February 2001, Saxton was made the chairman of HASC's Subcommittee on Military Installations and Facilities, also called the Military Construction or MILCON Subcommittee. HASC Chair Bob Stump also named Saxton to be the chairman of the Special Oversight Panel on Terrorism. He also serves as Vice Chairman of the House Subcommittee on Fisheries Conservation, Wildlife and Oceans. As the Chairman of Congress' Joint Economic Committee made up of members of the House and U.S. Senate, Saxton is relied upon by the Republican leadership to develop substantive economic policy aimed at responsible reductions in taxes, balanced with a full-court assault on the national debt. Upon his first election to Congress, Saxton told the voters that his top priority was to balance the federal budget. And, in 1997, Congress, with Jim Saxton's leadership, did indeed balance the budget? for the first time in nearly 30 years. He also is attempting to reform IRAs to make it easier for workers to save more money for their retirement and tax mutual funds more fairly to promote middle-class savings. He is also the congressional watchdog of the obscure International Monetary Fund, which spends billions of dollars of U.S. taxpayers' money on foreign economies with little accountability. Saxton has taken his conservative economic philosophy and applied it to his environmental policy as the Vice Chairman of the House Subcommittee on Fisheries Conservation, Wildlife and Oceans. He lead the subcommittee as chairman between 1994-2000. In coining the term "environomics," Saxton has expressed his belief that a clean and healthy environment is absolutely critical to the maintenance of a robust and growth-oriented economy. Pointing to the fact that New Jersey derives more than half its annual economy from tourism, Saxton has advanced bills through Congress that cleanup our oceans and nourish our beaches. He remains committed to maintaining healthy fish stocks for commercial and recreational fishermen alike. Saxton has worked to build a reputation as a bipartisan conservationist dedicated to expanding protected federal lands, stopping ocean dumping and restoring fisheries. He champions legislation for clean smokestacks, public right-to-know laws and non-point source pollution reduction, and has worked hand-in-hand with the Sierra Club, Audubon Society, Sea Web, the National Coalition for Marine Conservation and other environmental groups. Saxton's third Committee assignment has served the Third District and the entire region well. As a senior Member of the House Armed Services Committee, Saxton gained the expertise necessary to demonstrate conclusively to the Base Realignment and Closure Commission (BRAC) that Fort Dix, McGuire Air Force Base, and Lakehurst Naval Air Warfare Center are critical to the protection of U.S. security interests. In fact, Saxton is credited for BRAC's decision to reverse a policy to close McGuire and, instead, expand the air base into the East Coast's Air Mobility Center. All told, more than $500 million has been invested into the modernization projects at McGuire over the past 10 years, and more is expected. Fort Dix has prospered under its new role as the busiest Army Reserve post in the Northeast, and has new services for veterans and military retirees. There are an estimated 69,500 veterans in the district, plus thousands more active and reserve personnel and military dependents. Saxton, who sits on the Merchant Marine Panel which oversaw the Panama Canal Commission, was instrumental in bringing the battleship USS New Jersey through the canal just weeks before U.S. control was turned over to Panama. Saxton's leadership enabled the New Jersey, one of the most decorated ships ever to sail, to be retired in the Delaware River where she was built and be reborn as a naval museum. South Jersey's longstanding military traditions got a shot in the arm with the January 2001 announcement that the Air Force intends to station 14 ultramodern C-17s at McGuire AFB to replace retiring planes. Saxton served in both the New Jersey Senate (1981-84) and General Assembly (1975-1981) prior to his coming to Washington, D.C. He is the father of two and has two grandchildren. He makes his home in Burlington County, New Jersey and spends his free time sailing New Jersey's beautiful coastal waters.